In 2017, Real Talks partnered with the GAA to deliver 11 mental health workshops across Ulster as part of the GAA’s Healthy Club project. The workshop was open to senior and minor club players, from all GAA codes, as well as the wider community. 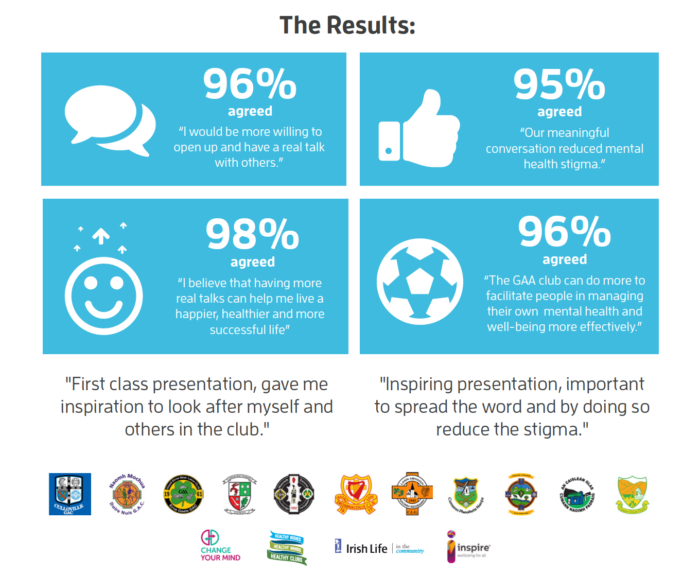 96% of participants agreed that GAA clubs can do more to help their players manage their mental health in a better way. We all need to get better at minding ourselves and looking out for those around us. To help share these key learnings for others, Alan O’Mara, Real Talks founder and former Cavan goalkeeper, worked with Rory O’Connor, from Rory’s Stories, to create a unique video (above) to show that we all have mental health and that every GAA club is a place where meaningful conversations can take place. When a friend, teammate or family member is going through a difficult time, it can be hard to know what to say. Remember, you don’t have to be an expert to make a positive difference. Sometimes just asking the question ‘How are you doing?’ and stopping to listen can make a real difference. As part of Men’s Health Week, running all this week, it is worth taking a minute to remember that underneath the jersey, all GAA players are normal people too. They experience the same challenges in life but can often experience additional pressures unique to sportspeople like criticism, injury, peer expectation, sideline negativity, social media, body image issues and more. Learn more about the GAA’s Healthy Club project at www.gaa.ie/community.